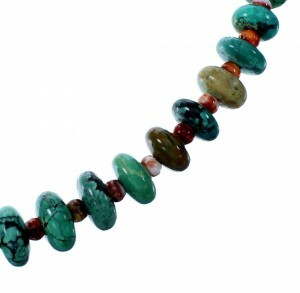 The necklace measures approximately 31-1/4" long. Hook dangle earrings measure approxiamtely 1-5/8" long (including hook) and 3/8" wide. 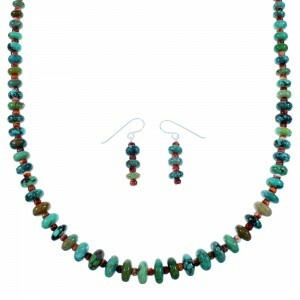 This magnificent and traditional necklace set represents the finest of Navajo craftsmanship! This piece of Native American jewelry is Navajo hand strung out of genuine sterling silver, real Turquoise, and Red Oyster Shell beads. 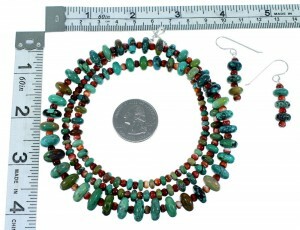 The necklace consists of: 4-mm Red Oyster Shell rondelle beads, and Turquoise rondelle beads that beautifully graduate, allowing the smallest beads at the end to measure 4-mm and the largest beads in the center to measure 12-mm. Each end of the necklace is completed with a silver cone for a remarkable finish. The cones are stamped sterling. 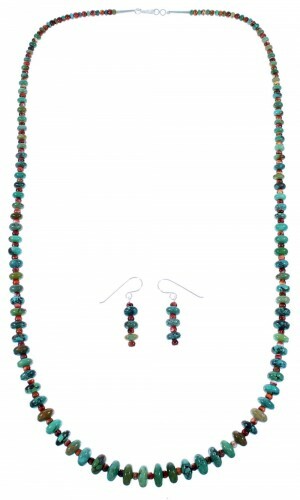 The earrings perfectly match the necklace, consisting of: 4-mm Red Oyster Shell rondelle beads, and 8-mm Turquoise rondelle beads.